Well, except for coffee mugs. Our coffee mugs did NOT seem new again! In fact, they seemed older, dingier, and dirtier than we remember leaving them. Whatever residual stains were left on them only seemed to multiply as they sat in that little 5′ X 10′ storage unit for 2 years. I washed and washed and washed them, and even though the stains got a little lighter, they never really went away. Eventually, I’d forgotten about them and decided that the stains just added character – some flair, if you may! Ughh, who am I kidding? I hated them…a lot! So this weekend, I finally decided I was not going to look at those nasty coffee/tea stained mugs for one more day! So I got to work. I researched, tried a few ideas, and settled on the one I liked best – of course I should’ve known the winning product would be my all-time favorite scouring agent ever – baking soda! So I put some baking soda into a shallow dish, wet a wash cloth with very warm water (I tried with cold water, it didn’t work as well), dipped it into the baking soda to make a paste, and got to scrubbing. Just a couple of quick scrubs, and I was already seeing those stains magically disappear! This of course got me super excited, which made me work even more diligently, and I had those mugs cleaned up in no time – seriously, it was less than 5 minutes! 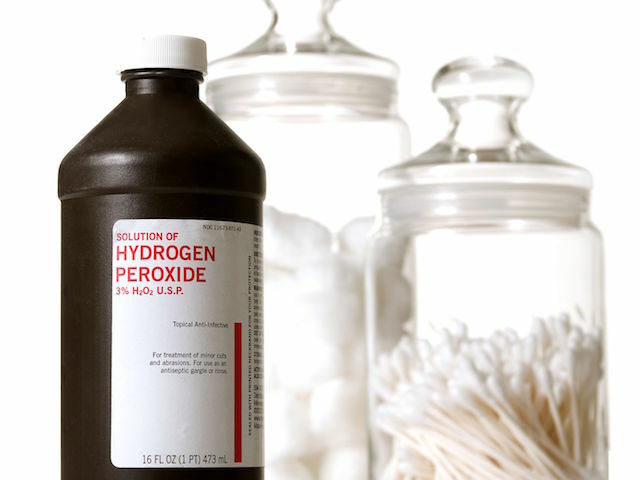 Note: For extra whitening power, a little peroxide added to your solution would work wonders! 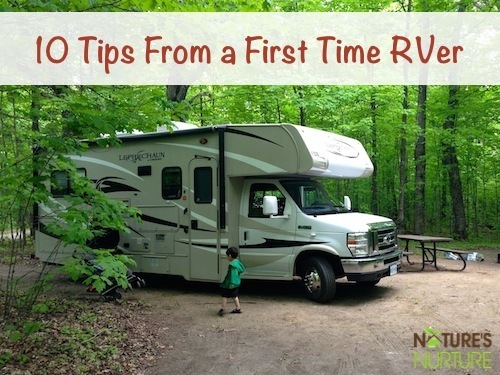 Thanks to reader, Sandy, for this great tip! 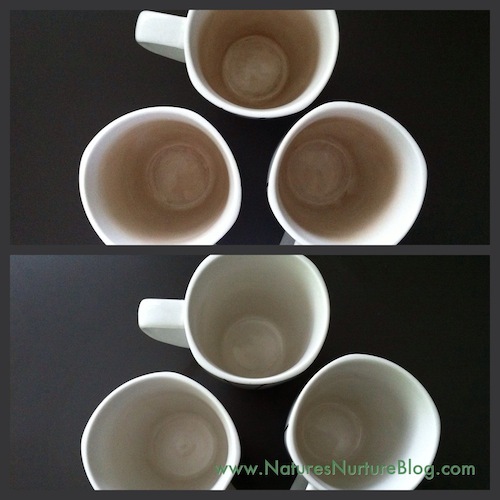 Have you dealt with stubborn coffe and tea stains on your mugs? How have you tackled this problem? Leave a comment with your solution! 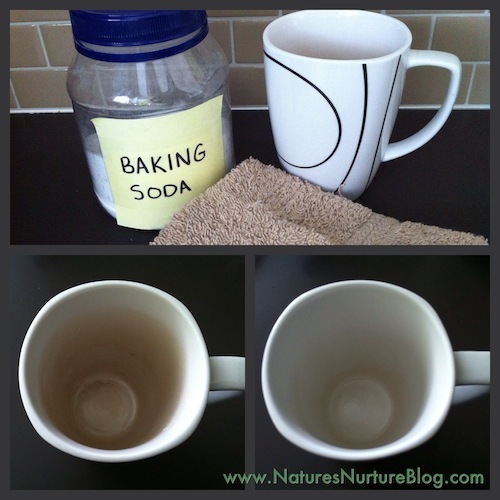 Baking soda and warm water are used to scrub away stubborn coffee and tea-stained mugs. Place some baking soda in a shallow dish. Wet your wash cloth with warm water. 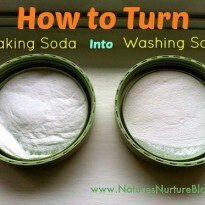 Dip wash cloth in baking soda to form a paste. I remember seeing an article on FB how you can clean your skillets and pots and pans that have build up of stain on the outside and also baking cookie sheets. Would you know what it was? If so would you post it or send to me. 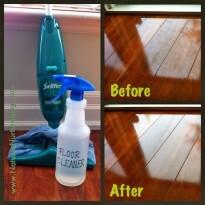 I use a spoon of vinegar and hot water to clean the stains. After sitting a minute wipe with a cloth and the cups are clean! Polident denture tablets. They are awesome for stains, no, none! Scrubbing at all. All I use is plain white vinegar, which works for me. I use it straight. The best thing I’ve tried is never let my cops or mugs get stained in the first place. I always use bleach and water to clean my coffee cups and then wash them good in dawn and water. 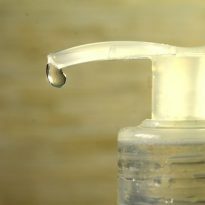 Just a squirt of vinegar (I keep a picnic ketchup/mustard bottle full of vinegar right by the faucet) and a quick swipe with a nylon scrubber covered sponge will have the cup looking brand new in under 10 seconds. I have used 1/2 tspn. 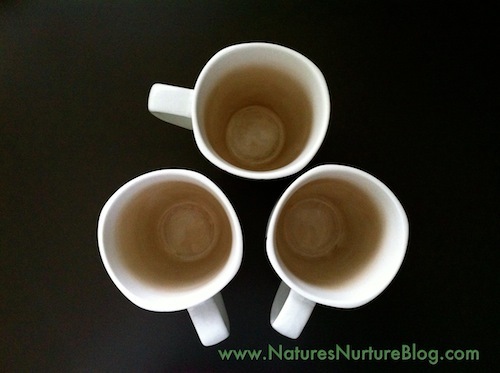 dishwasher detergent in the cups and fill with hot water…. do the other dishes and by the time you finish your cups are ready for rinsing and will be nice and clean. I use Domestos or Bleach. Little bit in cup with boiling water and the cup is white again. When I do my dishes I also put Domestos in the water. Keeps your dishcloth clean at the same time. Great idea!!! Here;s another solution and perhaps without the scrubbing. Put a denture tablet or 2 in a bucket (I use an ice cream pail) with warm water– add cups and walk away for a few hours. You will be amazed at how clean they have become. Denture tablets also work well on pots with burnt on food. I also use them in the toilet bowl every couple of week for a sparkling white shiney clean toilet…I just drop 3-4 (depending on how soiled it has become from the rust in the water) last thing at night. Salt, ice, and about a tablespoon of water. Swish it around in the cup. Works better and faster. No scrubbing at all. No peroxide for extra whitening power. I put a tablespoon of bleach and with water in the cup and let it soak overnight. No need to scrub!! 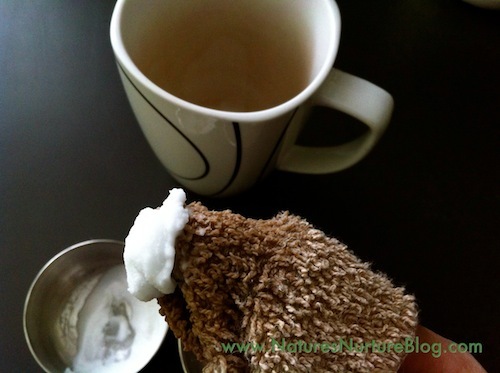 I have used bleach in the past to whiten my cups but will have to give this a try! Just FYI…add a little peroxide to make a paste with the baking soda and it will help to “bleach” them white again! 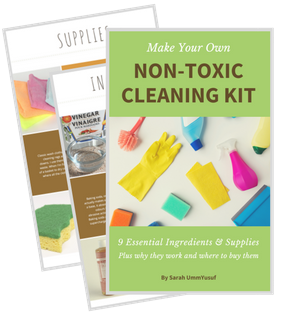 Safe and non toxic! I use it to brush my teeth once a week. It keeps the tea and coffee stains under control! 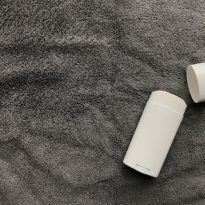 I usually use good old cooking salt, but have been known to succumb to the Magic Eraser – a microfibre sponge – that removes stains on absolutely any hard surface magically! I love using salt for a lot of cleaning too! I used to be a huge magic eraser user as well, but finally decided it just wasn’t environmentally friendly or sustainable. Plus, it’s not something I want my toddler getting into, so after my last one was finished, I never bought anymore. But I did try to stretch that last one as far as I could LOL, because they really are magical! 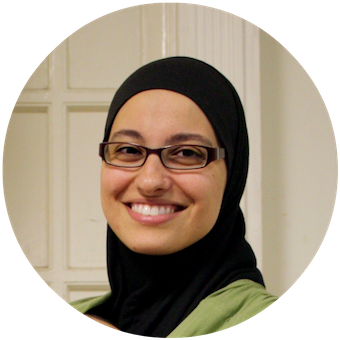 Your blog looks absolutely scrumptious – going to check it out some more! 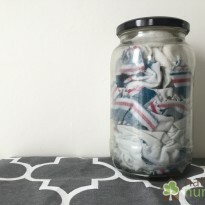 Ahh, I keep meaning to look online to find the best natural way to get rid of those pesky coffee stains, but the Frugal Days, Sustainable Ways blog hop delivered it to me 🙂 Thanks for the tip! Great tip, your mugs look great. I reckon a carnival is a great idea! Yes yes yes! I think its a great idea for a carnival because its different- a short, quick tip for better living. I like! Sign me up, Id join right away next week, it will help give me some aim for an early-week post. 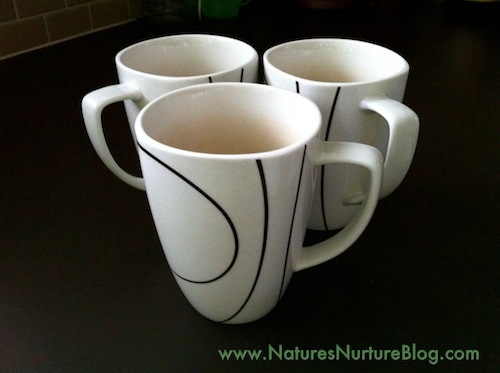 And thanks for this tip, those mugs look great! yay for baking soda and a little elbow grease!